ANA’s 787 from Taipei to Tokyo was a fine option for a regional hop. The pros: friendly service, great food and plenty of in-flight entertainment. The cons: a tight seating arrangement on this nine-wide aircraft. I was excited to try out ANA for the first time while positioning back from Taipei (TSA) to Tokyo (HND) after a series of mileage runs. Having flown 34 other airlines over the past decade and plenty of Japan Airlines flights recently, I was interested in finally testing out Japan’s other global airline. In order to save a few hundred dollars on my positioning costs, I booked this double-open-jaw flight out of Houston (IAH) into Hong Kong (HKG) and back from Taiwan (TSA) to Austin (AUS). Even after tacking on the $20 Megabus fare from Austin to Houston and 4,500 Avios for an award flight from HKG to TPE, I still came out well ahead of what it would have cost to book a simple Austin-Taiwan itinerary. I charged the $555 ticket to my Chase Sapphire Reserve and earned 3x points for my travel purchase. While online check-in was supposed to open 24 hours prior to my departure, it didn’t seem to be working. When I clicked the “Check In” button from my United confirmation email, I was taken to the ANA website homepage — since United hadn’t provided me with an ANA confirmation number, I needed to retrieve my United ticket number first in order to access my itinerary on ANA’s website. Check-in was unavailable online inside 24 hours prior to my departure. Once I was able to login and view my itinerary, I noticed that my United MileagePlus number was showing instead of the Singapore Airlines KrisFlyer number that I’d entered at booking (with United). 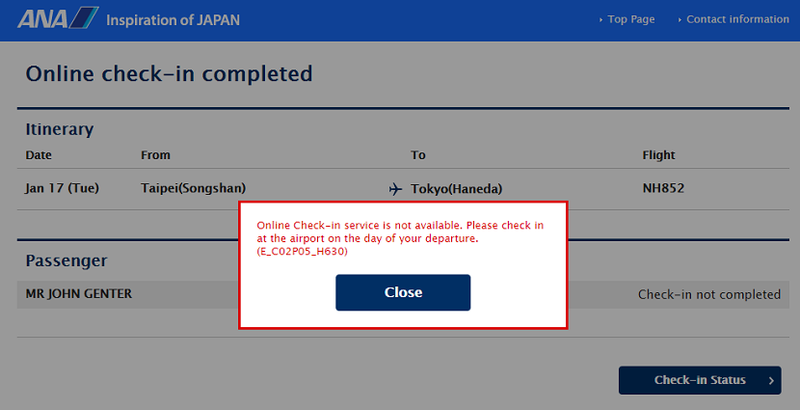 Strangely, as a result, I was unable to change this number, change seats or check-in online. Assuming this was an error, I called ANA and the agent confirmed that the seat map was already under airport control and that I’d need to check-in at the airport at this point — she was able to change the frequent flyer number on the reservation though. While ANA’s “K” booking class doesn’t earn miles for Singapore’s KrisFlyer program, I’d still come out head by crediting my transpacific flight to KrisFlyer instead of United, given that UA awards miles based on the cost of the ticket. 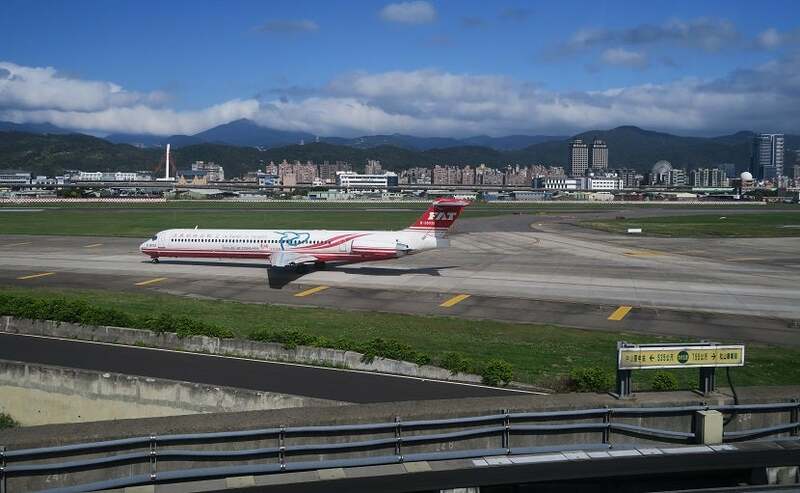 Getting to Taipei’s Songshan airport (TSA) was quite easy — especially compared to the difficulty of getting to/from Taipei’s Taoyuan airport (TPE). From my downtown hotel, it cost just NT 20 (~$0.63) to take the metro’s Brown Line to a metro stop just outside the terminal. Metro riders get great views of the airport’s tarmac en route to the airport. From there, the check-in process took a matter of minutes. 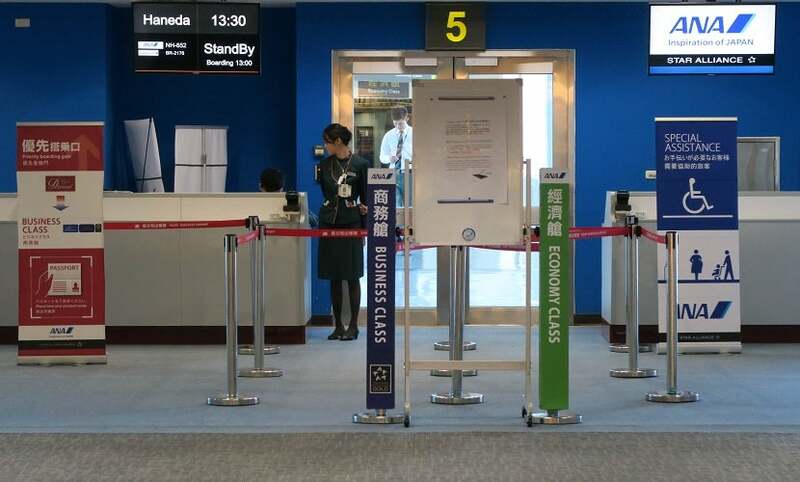 I made it from EVA Air’s Pepper check-in robot — the sibling to the one I’d visited in a lounge at the other Taipei airport — through both security and immigration and to the door of the airport’s lounge in just under five minutes. There was no line at check-in when I arrived, helping me to speed through the airport in no time. 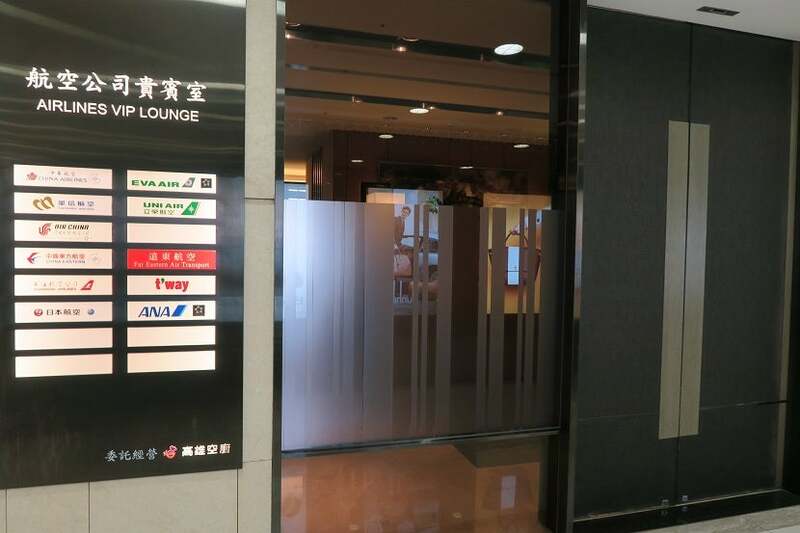 There’s only one lounge in Taipei’s Songshan airport (TSA) and as a basic member of Star Alliance, I didn’t have access — note that this lounge also isn’t part of the Priority Pass program. Although I was worried about arriving at the airport just 80 minutes prior to an international departure, I found myself airside with 70 minutes to go — that’s 40 minutes until boarding — and looking for something to do. Airline elite members can use the “VIP lounge” at TSA. 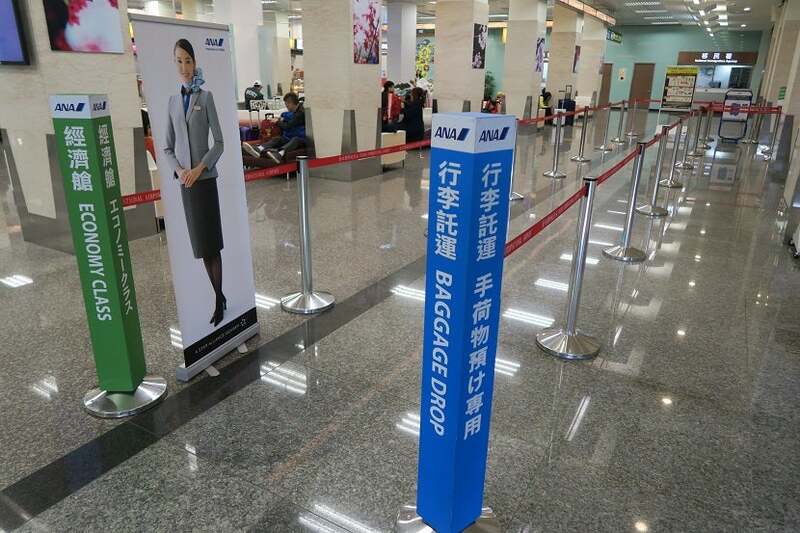 Thankfully Songshan airport delivered. The terminal was full of informational displays and lots of neat little waiting areas. 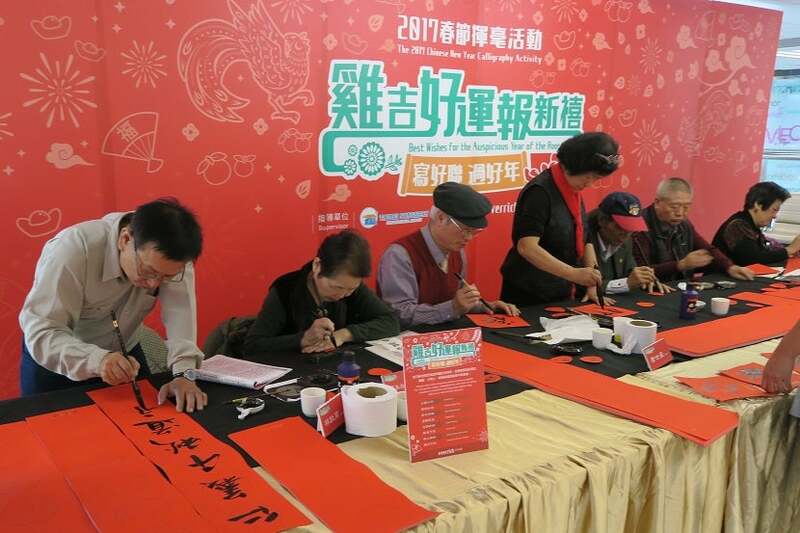 The day I flew was especially interesting as the airport was hosting a group of calligraphers to write Chinese New Year greetings for travelers passing through. Travelers were able to get Chinese New Years greetings. Boarding was scheduled for 30 minutes prior to departure. Despite the aircraft seemingly being ready well before this time, the gate agents waited until that time to let us begin. At 32 minutes to departure, the gate agents boarded special assistance passengers and families, followed by ANA Diamond members at a minute after boarding time. Next, business-class passengers and Star Alliance Gold elites were welcomed. Finally, economy passengers began boarding at 25 minutes prior to departure. By 10 minutes to departure, all passengers were seated and the aircraft pushed back six minutes early. Boarding was orderly and surprisingly quick. While some of ANA’s 787-8 Dreamliners only have eight seats across, the version I was traveling on happened to have the regional 3-3-3 seating arrangement, the same seating arrangement you’ll find on almost every other airline. One notable exception to this is Japan Airlines’ 787, since JAL flies its eight-wide 787 aircraft between these same two cities, only from Taipei’s Taoyuan airport (TPE) to Tokyo’s Narita airport (NRT). The seats are arranged into 3-3-3-seat rows on this version of ANA’s 787-8 Dreamliner. 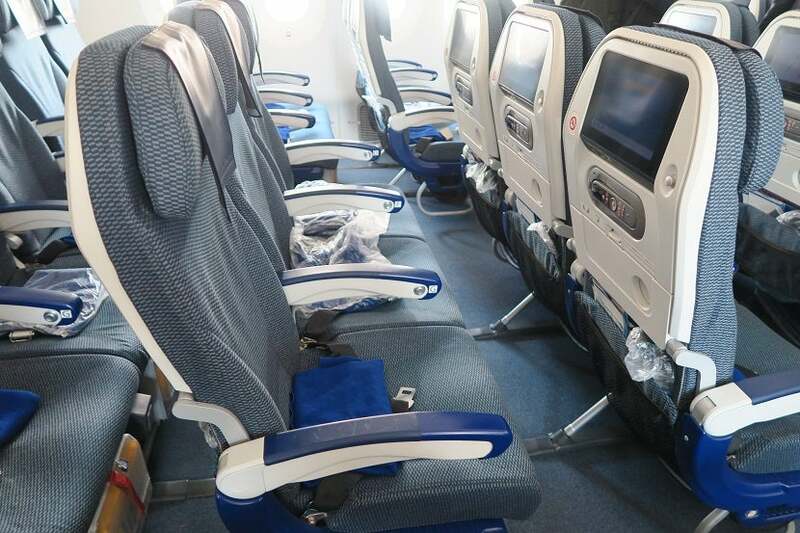 This nine-wide arrangement means tight seats across the economy cabin. In my on-board testing, the seat pitch measured 30.5 to 31 inches. 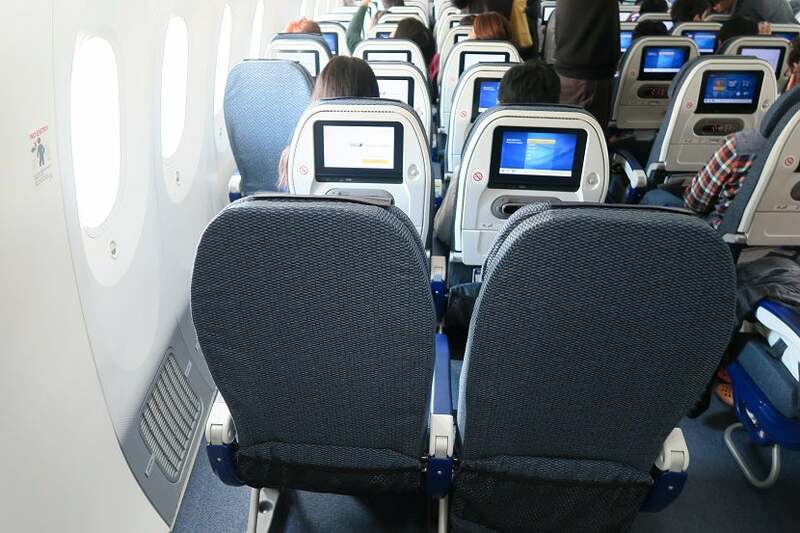 There were 17 inches between armrests, while the seats themselves measured 18.5 inches wide. The aisles were also a bit snug at 17 inches wide. The nine-wide seating arrangement required narrow seats and narrow aisles. Speaking of armrests, they were almost completely flush with the seat when raised, which is useful if you want to lean on your neighbor (hopefully consensually) or if you happen to have an empty flight and want to spread out a bit. While my flight that day was full, the seats can be transformed into a nice everyman’s lie-flat seat if you’re lucky enough to be on one that isn’t. You might be able to lie flat in economy if you end up on an empty flight. Each seat came with a blanket and plastic-wrapped over-the-ear headphones. Strangely, only about half the blankets were plastic-wrapped, giving an inconsistent appearance at boarding. Surprisingly sizeable pillows were offered by flight attendants once boarding was completed. Headphones, a blanket and a pillow were available to each economy passenger for the short flight. Despite being designed for shorter, regional routes, the seats offered a moderate recline and had adjustable headrests. Both of these features made it comfortable — well, at least as comfortable as you’re going to find in economy — for taking an in-flight nap. Unfortunately, this is just what the passenger in front of me did immediately after takeoff. Due to the narrow pitch and moderate recline, it became quite difficult to work on even my small 12.5-inch laptop. Seats have a decent recline — which is good for napping, but bad if you want to work on a laptop. If you’re a traveling couple looking for two-seat pairs, there are only three options: 33A/C, 33K/H and 34A/C. While the seats in row 33 have standard recline, the seats in row 34 don’t recline at all because the exit corridor is located behind them. Couples traveling together might want to consider row 33, but not row 34. There are four bathrooms in economy: two in the galley between the front and back economy cabins and two in the back of the aircraft. 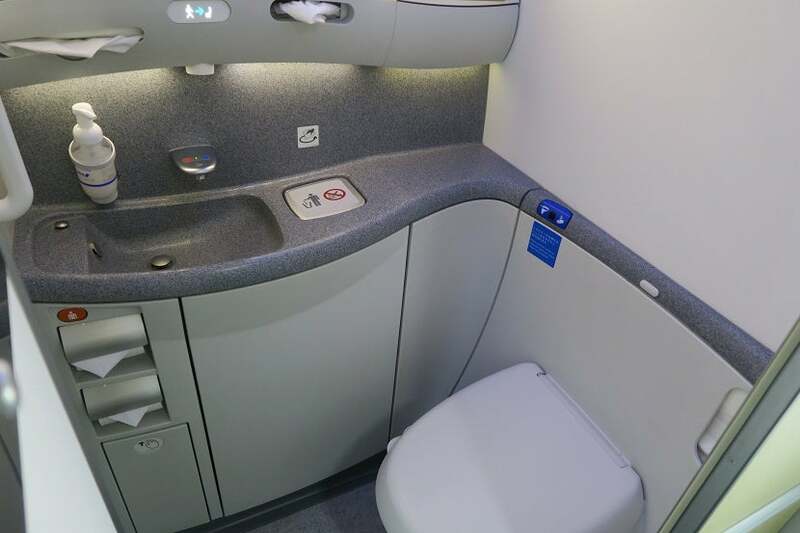 All four had Dreamliner touchless-flush and touchless-sink features. Three of the four bathrooms included a Japanese bidet-style toilet, so if you don’t want to try one of those out, head to the back-left toilet. The toilet on the left side in the back of economy was the only bathroom without a bidet. Despite “none” being listed on my United ticket as the provided meal, a full hot meal was served on this short three-hour flight. 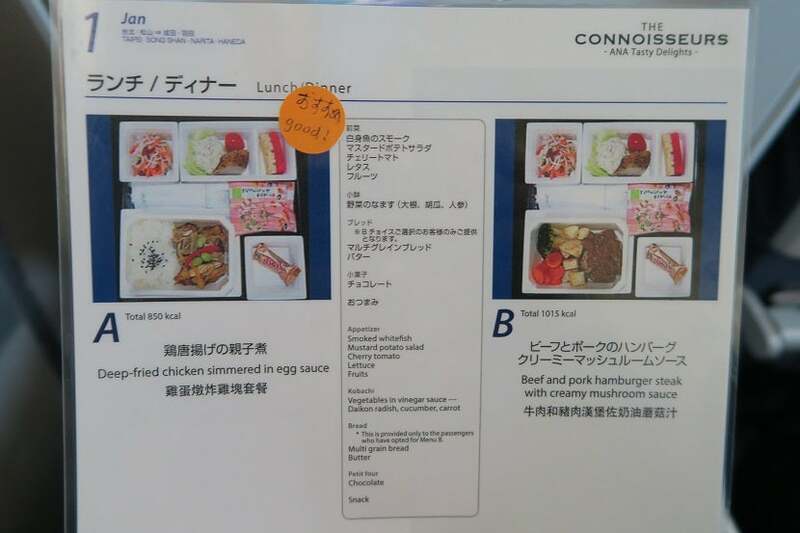 Food options weren’t pre-announced, but a menu card — complete with English translations and caloric values — was presented individually to each passenger to help us decide. January’s meal option on this route was a choice between “Deep-fried chicken simmered in egg sauce” and “Beef and pork hamburger steak with creamy mushroom sauce.” At the suggestion of the the “Good!” sticker that was on the menu, I chose the first option. I was offered a choice between chicken and beef/pork. The chicken dish was very good considering it was an economy meal, and the accompanying fruit and cucumber/carrot salad were both crisp and fresh. The potato salad and peppered, smoked whitefish were an interesting combination. 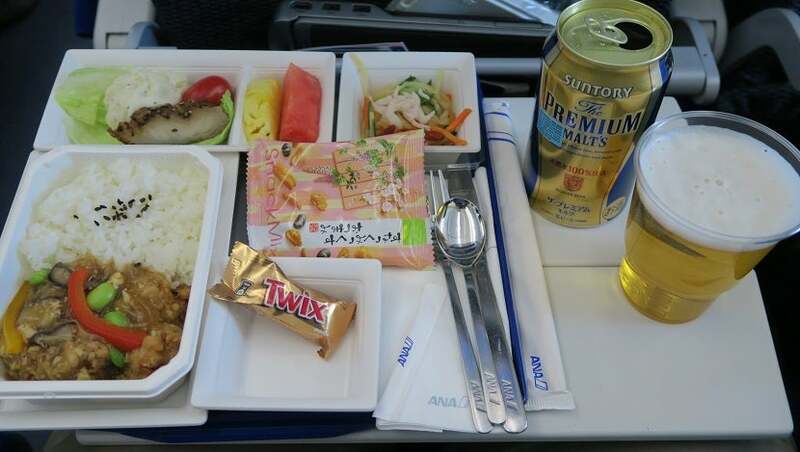 Food was served with ANA-branded metal silverware and disposable chopsticks. Overall, everything was tasty and filling. Since meal prep, service and collection took up much of our short flight, there was just one beverage service, which occurred at the same time our meals were served. Drink choices were wide-ranging and included sodas, juices, beer and wine. I went with the “Premium Malts” beer I’d enjoyed during my time in Japan and on Japan Airlines. The chicken dish was pretty good for an economy meal. Once we reached 10,000 feet, I was quickly able to connect and pay. 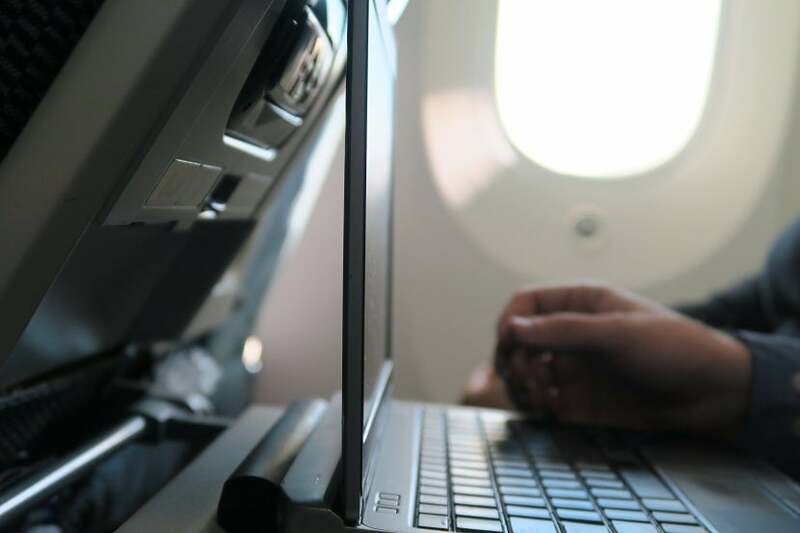 Sadly, this was the last “quick” part of the onboard Wi-Fi experience — while I was able to stay connected for the entire flight, the internet remained quite slow but was still usable for basic tasks. I would recommend forgoing the Wi-Fi altogether unless staying connected is a must. 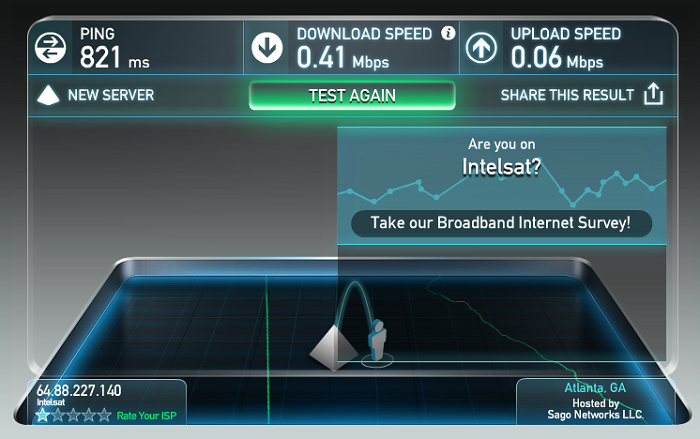 The internet tested very poorly but was usable for basic tasks. From the check-in desk to the gate in Tokyo, the service was top-notch — I was always greeted with a smile and an English greeting. The check-in and gate agents were contract EVA Air agents who were mostly fluent in English so I didn’t have any trouble with standard interactions. 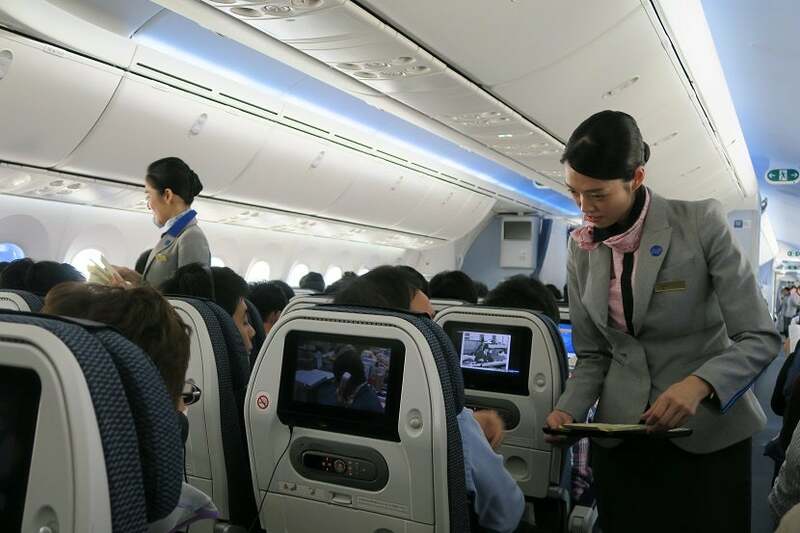 During the flight, all the ANA flight attendants I spoke with were very friendly and fluent in English. Service throughout my first ANA experience was excellent. To explain my photo taking during the boarding process, I explained to a curious flight attendant that this was my first time flying on ANA. She remembered this and clearly shared it with the other flight attendants, as they brought it up often. As we were taxiing, another flight attendant noted that she was happy that this was my first time with ANA. During descent, another flight attendant gave me an ANA Star Wars paper model plane — this special treatment was a bit over-the-top and I wonder what the other passengers were thinking. The flight attendants were generous to me during the flight, almost overly so. The flight attendants always seemed to be busy during the flight. From cooking and serving lunch to running the very popular on-board duty free shopping and handing out arrival documents, they certainly had their work cut out for them on this three-hour hop. However, any frustrations they might have had were invisible to the passengers. 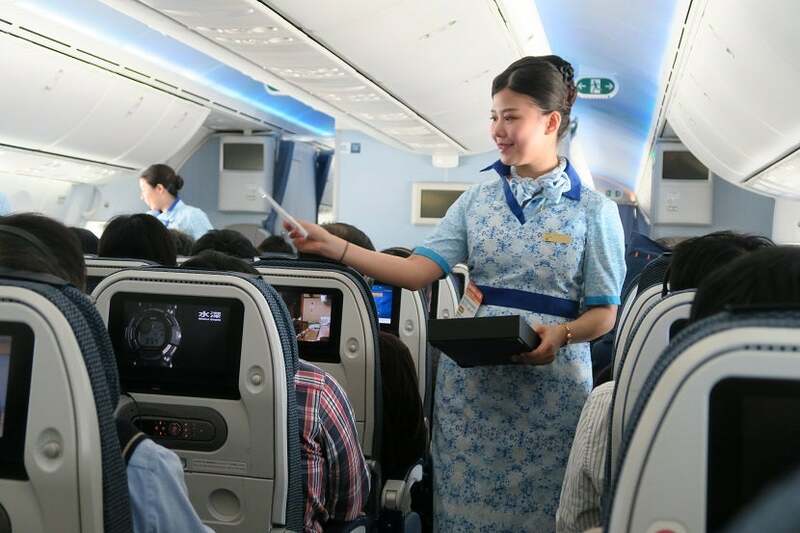 The flight attendants were kept busy throughout the flight. 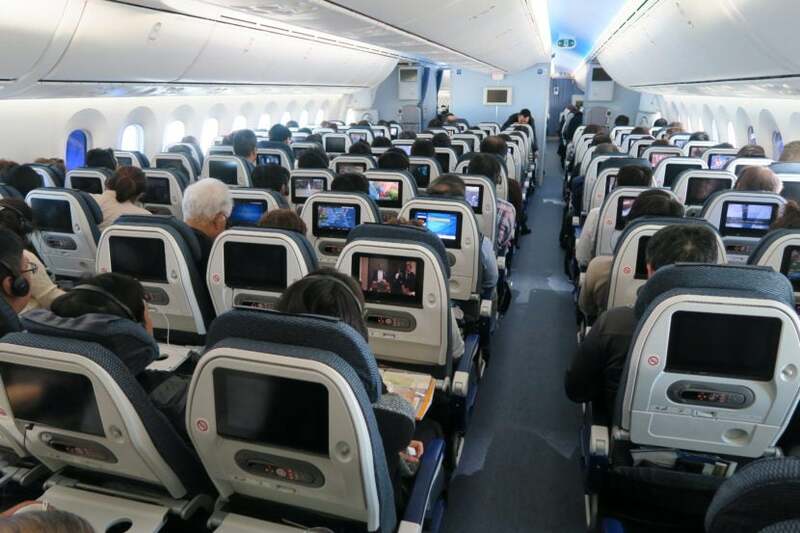 Each seat had a touchscreen on-demand in-flight entertainment screen that offered movies (48 new releases), live tv (from takeoff to touchdown), in-seat duty free shopping and a flight map. There was even an option to send messages between seats if you were separated from your traveling companion(s). For those wanting to watch or listen to entertainment you brought with you, there was an option to plug in an iPod or connect a device through the USB plug. The in-flight entertainment system was well-stocked, especially for such a short flight. 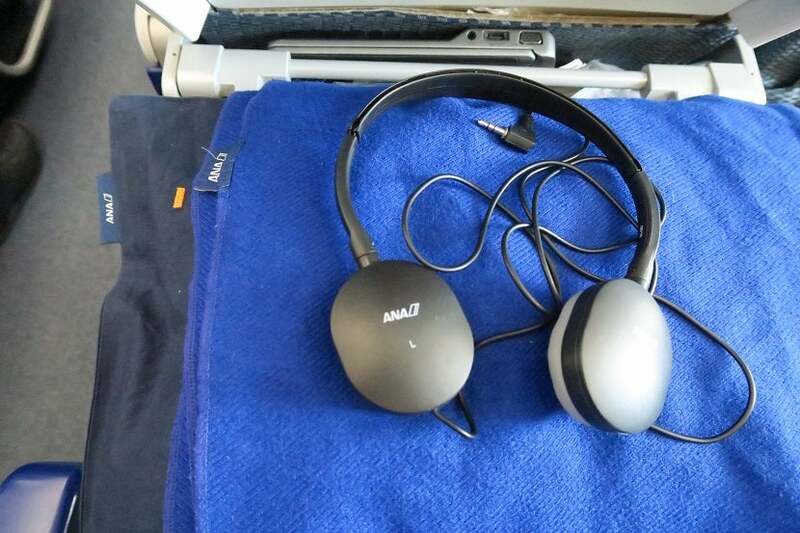 The provided headphones were some of the best I’ve had in an economy cabin yet. If you’d rather use your own earbuds or headphones, the audio jack was standard size. 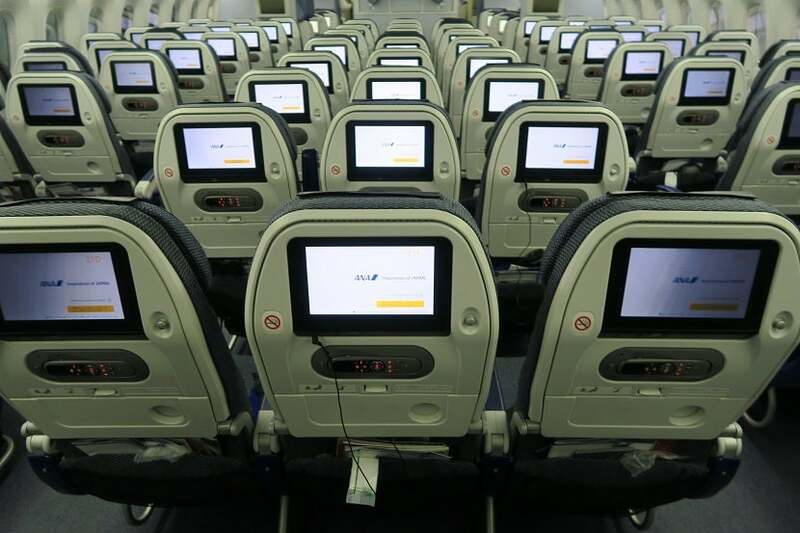 The IFE screens were fixed in place, so it was difficult to see them when the passenger in front of your reclined their seat. Each seat also offered a universal power plug under the seat and a USB plug under the touchscreen. Compared to other airlines’ lengthy and “over the top” safety videos, ANA’s was sharp-looking but succinct and refreshing. 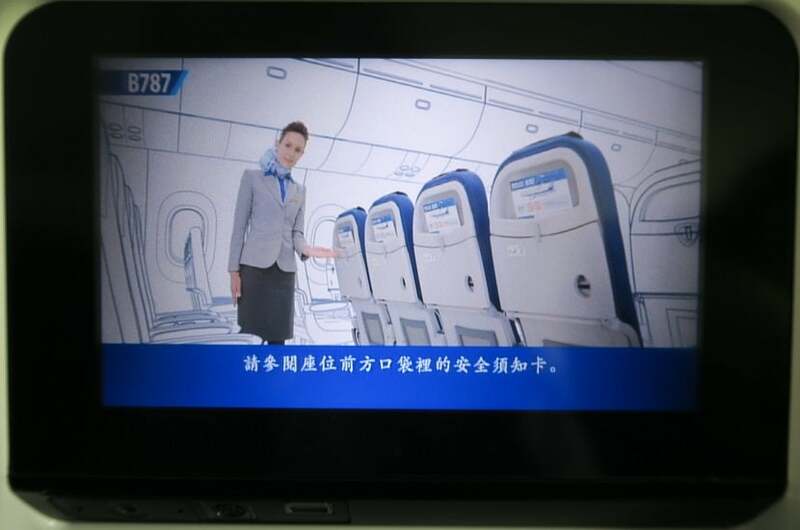 I couldn’t help but notice the 787 cabin featured heavily in the safety video was in the 2-4-2 arrangement rather than the tighter nine-wide seating arrangement we had on this flight. ANA’s sharp and modern-looking safety video was refreshingly not over-produced. ANA flight attendants secured the cabin about 10 minutes prior to landing, which was much more appropriate timing than other flights I’ve been on when flying within Asia. The landing was pretty rough though, eliciting gasps from nearby passengers. Gate arrival and disembarkation were otherwise unremarkable. From excellent service to great food and wide-ranging entertainment options, my first experience on ANA was just about all I could ask for. The only downsides that I can point to are the narrow seats and small amount of pitch. However, as airlines are having to compete more based on price than experience, this tightening is becoming the standard rather than the exception. Overall, I’d be very happy to take this flight again. 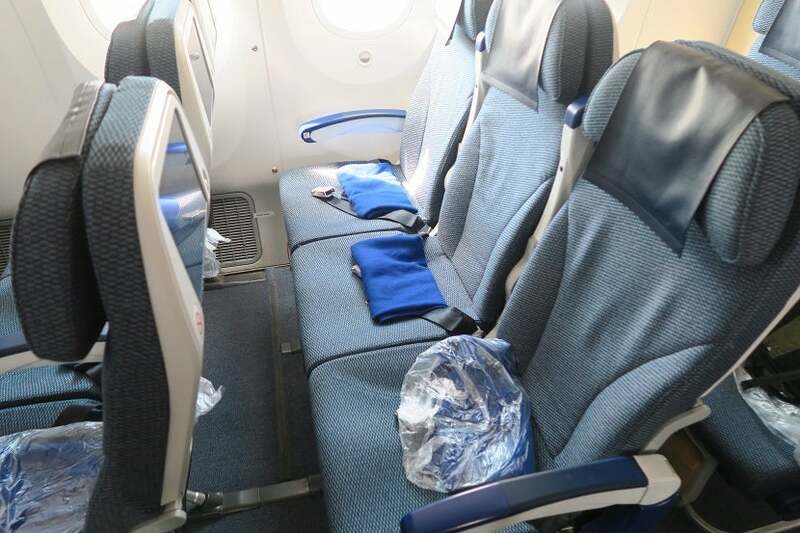 Have you flown in economy on ANA before? Tell us about your experience, below.